Bootstrap 4 carousel contains different types of carousels including slider with thumbnails, multiple items carousel, fade effect carousel, bootstrap image slider gallery etc. Over 200+ pre-built examples and layouts are the part of this product. The carousel is compatible with mobile and tablet devices and all latest web browsers as well as 100% responsive. 150+ documentaion files make easy to understand and helps you to place it on your website. These both items are also included in this item. Bootstrap is the most popular front end framework in the world. It is 100% responsive, mobile friendly with advanced features. If you are not using Bootstrap then it is the time to upgrade your site from classic to modern. If you are already using bootstrap in your project then this product can full fill your all needs of sliders and carousels elements. 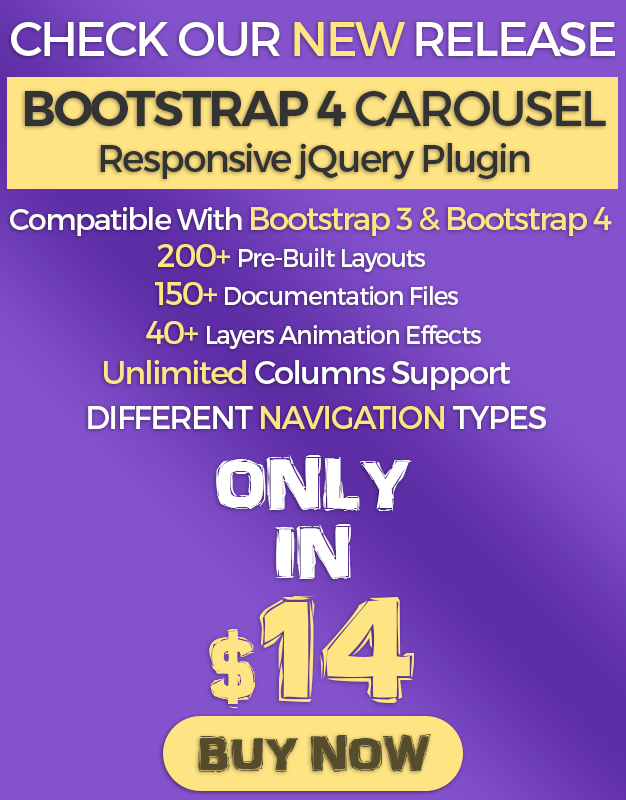 And Bootstrap 4 Carousel will save a lot of time which you will spent on compatibility issues those are created by other plugins.